New Zealand might be a relatively small country – but when it comes to rugby it's the biggest name of them all. The All Blacks national team are – as usual – this year's favourite to win the Rugby World Cup 2015. It's no wonder, then, that they're the go-to side for advertisers looking for a plum sponsorship deal. The New Zealand rugby team has become synonymous with the Haka – a traditional ancestral war cry and dance of the Maori people of New Zealand carried out by the team as it takes the field. And what better team to advertise with than one that has an iconic tradition that’s known the world over? Team sponsor AIG has seized on the opportunity presented by the Haka – creating a 360° Haka experience that uses Google Cardboard virtual reality technology to place viewers alongside the All Blacks as they perform the ritual. Mindful of the Haka’s cultural significance, AIG’s promotional microsite for the app includes sections on the history of the ritual. It also highlights AIG’s role in reconstruction efforts following the 2010 earthquake in Christchurch – where the filming for the VR experience was carried out. AIG’s 5-year contract with New Zealand Rugby Union is worth $80 million – but it’s by no means the biggest sponsor. Back in 2008 Adidas extended its sponsorship contract with the All Blacks right the way through to 2019. The value of this deal was not disclosed – but New Zealand Rugby Union CEO Steve Tew said he "would be surprised if it was not the biggest sponsorship package in the world of rugby". 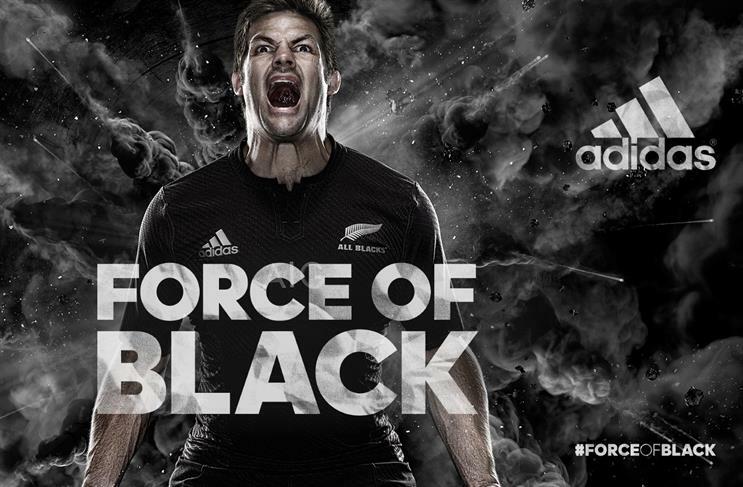 Ahead of the Rugby World Cup 2015 Adidas has created the "Force of Black" campaign; headed up with a dark, stylish and dramatic advert that builds to a powerful crescendo. The advert stars Dan Carter, Ma'a Nonu and Jerome Kaino mentally preparing for the tournament, interposed with footage showing the power of nature and the team on the field. We defy you to watch it without the hairs standing on the back of your neck. Adidas is also encouraging fans to share their enthusiasm on social media using the #ForceOfBlack hashtag – one factor that's helped to earn the All Blacks the title of "Most Social Rugby Union" club in this year's RWC. Adidas didn’t leave it at that though; it's also created a series of videos to support the campaign. One stars Sonny Bill Williams talking about how it feels to play for his country. Like the lead advert, this video is shot in black and white or heavily desaturated colour, for a subtle continuation of that All Blacks theme. Another profile video features All Blacks captain Richie McCaw talking from his perspective. As the first All Black to reach 100 caps and the most capped player of all time this makes for compelling viewing. For the World Cup itself, Adidas has taken the Force of Black campaign to London, setting up a special running machine wind tunnel on London's South Bank for the public to try. It was supposed to recreate what it feels like to play against the All Blacks. All Blacks sponsors Steinlager, meanwhile, harks back to the past with its "Originals" campaign. The ad highlights the 1905 winning New Zealand team in an appropriately patriotic ad that enables Steinlager to play up the 1905 team’s status and tug on the heartstrings – although nowadays the All Blacks are the favourites to win. Sanitarium – makers of Weet-Bix, the All Blacks’ official breakfast – has created a modern take on the old collector’s album. Fans can collect cards found inside packets of Weet-Bix, entering a code to upload them to a "virtual album." They can also create their own card, superimposing their face on an All Blacks jersey along with their (presumably less-than-impressive) stats. Special "Golden Cards" along with different combinations of cards unlock the chance to win prizes, including rugby balls, tracksuits and TVs. Like other nations in the southern hemisphere, New Zealand is wrestling with the thorny problem of how to watch the games as they’re played in the UK. All Blacks sponsor ASB Bank has created a special coffee blend that’s distributed through its branches across New Zealand, in order to give fans the pep-up they need to get up for the early matches. It’s even enlisted the help of the All Blacks to grind the beans. Inevitably, ASB is also pushing its own hashtag – #UpForTheGame – offering fans the chance to win supporter packs. Over in the UK, some advertisers have been dumped in the sin bin for mocking the Haka – plus-size fashion brand Jacamo has come under fire for its "Hakarena" video featuring former England rugby player Matt Dawson. Sir Pita Sharples, former co-leader of the Maori Party, said the send-up was "insulting" – a reminder that the iconic ritual is also a cultural tradition, and that brands should be wary of the reprecussions of send-ups. What are Rugby World Cup sponsors really doing for the humble fan?